Obstetric anesthesiologists provide full time, onsite coverage in our Labor and Delivery suite. 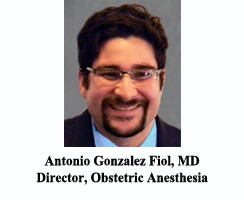 The anesthesia faculty, under the direction of Dr. Antonio Gonzalez Fiol, provides consultative services for high risk patients, labor epidurals and anesthesia for all Caesarian sections. The obstetric service at University Hospital provides care to the inner city population of Newark, New Jersey. It is a unique population with a large number of parturients who are high risk patients due to their age, lack of prenatal care and other co-morbidities. Over 2000 deliveries are performed each year, including approximately 700 Caesarian sections. The percentage of women receiving regional anesthesia for labor and delivery has increased as anesthesia faculty and residents collaborate with obstetricians to provide safe and pain free deliveries.